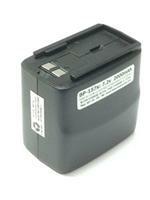 CNB-163 : 7.2 volt 1200mAh rechargeable Ni-Cad battery for STANDARD C168, C468, C178, C568 etc. The CNB-163 is a 7.2volt 1200mAh long-life rechargeable Nickel Cadmium battery pack for STANDARD radios such as C168, 468, 178, 568 etc. The battery pack is 3" tall; custom slim-line design to match the radio. BP-210N : 7.2v 2000mAh LONG LIFE Nickel Hydride battery pack for ICOM radios. Fits IC-V8, IC-V82, IC-U82, IC-A24, IC-A6, IC-F3GT/GS, IC-F4GT/GS, IC-F30GT/GS, IC-F40GT/GS, IC-F21BR, etc. INCLUDES screw-on spring-loaded belt clip. CNB-163xe : 7.2 volt 2100mAh rechargeable NiMH eneloop battery. PRE-CHARGED and READY TO USE. CNB-163xe : 7.2 volt 2100mAh rechargeable NiMH eneloop battery for Standard C168, C178, C468, C568, etc. Made with SANYO eneloop NiMH cells. Arrives to you PRE-CHARGED and READY TO USE!